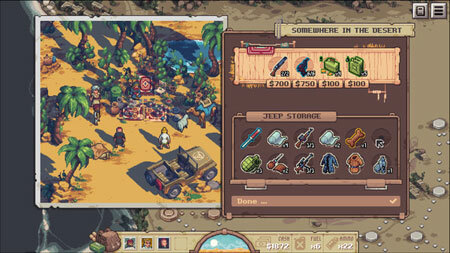 Pathway is a pixel RPG adventure developed by Robotality, set in the 1930s great desert wilderness. Outwit your enemies in daring turn-based combat, raid occult tombs and make tough choices in a procedurally generated grand pulp expedition. Assemble a team of bold adventurers, and journey through the deserts, explore bunkers, and temples of Northern Africa to discover their hidden treasures and secrets before they fall into the hands of Nazi forces. You and your companions must work together to overcome overwhelming odds. Journey into the unknown and uncover hidden secrets, treasures, characters, and events which have been buried away. There’s a wealth of discoveries to be found, and surprises to excite you throughout each adventure. If you get stuck in the game, check out the video walkthrough and gameplay for the game. This entry was posted in PC Games, Walkthrough and tagged Pathway Cheats, Pathway Gameplay, Pathway Guide, Pathway Strategy, Pathway Walkthrough by Marvin. Bookmark the permalink.